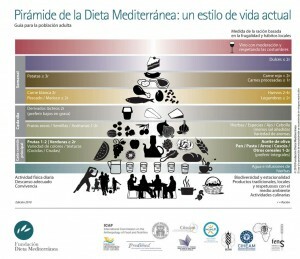 The pyramid of the Mediterranean Diet (MD) has caught up to adjust to the current life style. 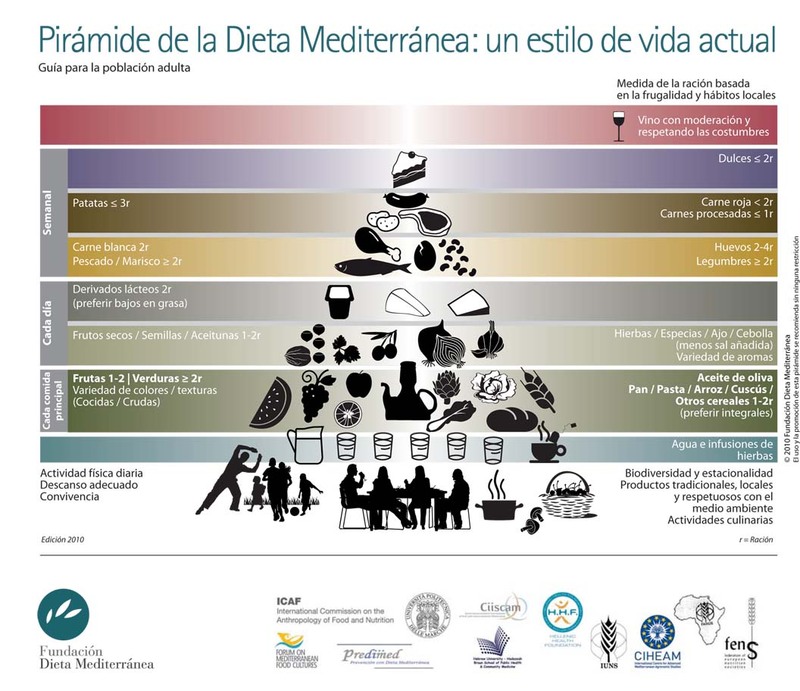 Thanks to the initiative of the foundation Mediterranean Diet and the collaboration of many international institutions, a wide group of experts belonging to different disciplines such as nutrition, anthropology, sociology and agriculture have agreed a new plan that fortify the classic graphic representation with the introduction of qualitative elements. The new pyramid follows the pattern of the last one: place at the base those foods that must sustain the diet. Continued in the upper layers, wich are graphically thinner, by the ones that must be consumed with moderation. But it also adds cultural and social indications linked to the mediterranean life style. It does not try to give priority to a particular type of food but to the way of selecting, cooking and consuming them. It also shows the composition and the portion number for the principal foods. The benefits of the Mediterranean Diet over health and its role on the prevention of chronic diseases is currently a scientific proof. The pyramid that represents this benefits includes all food groups. Making a diet healthy or harmful depends on the amount and the frequency of the consumption. A pattern in the diet is neccesary for the adult population for having a healthy life and it has to adapt to the specific necessities of children, pregnant women and people with health conditions. The base of the pyramid is stablished with those ingredients from vegetable origins that provide essential key nutrients and other protective substances that contribute to the general well-being and reach a balanced diet. For this reason, thay must be eaten with much more frequency and quantity than the food lcated on the central levels or the top. The top ones must be only consumed in moderate amounts or in few occasions leaving them for parties or special events. The pyramid establish healthy eating guidelines, daily, weekly and occasionally to reach a healthy and balanced diet. Principal meals must always have 3 basic elements: Cereals. One or two rations of bread, pasta, rice, couscous or others. They must be preferably integral cereals because some nutrients like magnesium, phosphorus or fiber can be eliminated during their process. Vegetables Must be always consumed in lunch and dinner, approximately two rations in each meal. At least one of them must be raw. Variety of colors and textures give several protector substances and antioxidants. Fruits are also essential: One or two rations each meal, always as dessert, make the perfect amount. We have to guarantee the ingestion between 1,5 y 2 litres of water. A correct hydration is essential for keeping a good water corporal balance. It is true that the nessesities change depending on the age of each person, the physical activity, personal situation and climate conditions. Regarding the quantity of water consumed, you can also be hydrated by drinking herbal infusions with moderate sugar and low fat and salt soups. Dairy products principally as yogurt format and low fat cheese. The consumption must be moderated (2 rations each day), contributing to make stronger the bones, but it can also be an important source of saturated fats. The Olive oil, placed in the middle of the pyramid, must be the principal source of fat thanks to its nutritional quality. It can be used to season and cook (One big spoon) because the unique composition of the oil gives it high resistance to high cooking temperatures. Species, herbs, onions and garlics are a great choice to introduce different tastes and flavours into our meals, and also a good strategy to reduce the use of the salt. Olives, seeds and nuts are a good source of healthy fats, proteins, vitamins, minerals and fibre. A couple of olives, nuts or seeds can be an excellent aperitif. Always when religion and social beliefs allow it, a moderated consume of wine or other fermented beverages (one cup per day for women and two for men) is recommended. Consume animal and vegetable proteins. Mediterranean meals often do not contain animal protein as the principal ingredient, but they are added to other prepared foods to make them tastier. Fish (two or more portions), lean meat (two portions) and eggs (2-4 portions) are a strong animal protein source with high quality. Fish and seafood are also a source of healthy fat. Consumption of red meat (less than two portions, preferably lean cuts) and processed meat (less than one portion) must be reduced in frequency and amount. Legumes mixed with cereals are a good vegetable protein source. Potatoes are included in this group and it is good to consume them frequently in traditional recipes of meat and fish (three portions preferibly fresh). In the highest part of the pyramid we find candy. Sugar, sweets, cakes, pastries, sugar juices and soft drinks must be consumed in little portions and only ocasionally.